Mussels, like these on Onetangi Beach in New Zealand, have inspired an international team of scientists to design an artificial, self-healing gel that lends itself to underwater applications. Niels Holten-Anderson - a post-doctoral scholar at the University of Chicago - says mussels do two things really well. They excrete a sticky adhesive and they can use that natural glue to repair the anchoring bond. University of Chicago Chemistry professor Ka Yee Lee, postdoctoral scholar Niels Holten-Andersen and team have invented a new synthetic mussel-inspired material that exhibits both strength and reversibility. "And the important thing to remember is that there are no cells. There is no live or living activity taking place inside these materials. The material is basically a dead material, just like our hair," says Holten-Anderson. "So this capacity to re-heal itself is completely automatic, and it’s not relying on any energy input from living cells." "The unique thing is that you can pull them apart and if you leave them be, they can find their partners again and re-heal, and that’s where the original strength of the healing comes from." 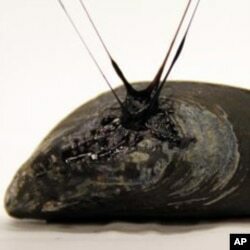 Mussels generate their own self-healing sticky material, which allows them to attach to rocks and to repair tiny tears caused by breaking waves and sand abrasion, but the elastic gel attached to this one was created in the laboratory. Holten-Anderson and colleagues set out to replicate that in the laboratory using a synthetic polymer or a simplified version of a string of mussel protein molecules. They succeeded when they pre-mixed the polymer with metal salts at low pH. "You instantly get an initiation of these self-healing gel-like, sticky materials as soon as you do this basically step-wise process of mixing things," he says, "and then increase the pH potentially mimicking what happens in the natural case anyway." Iron is the metal available to mussels in the environment. Holten-Anderson says scientists can expand that pallet and experiment with other metals. "We’ve shown so far that a metal such as titanium, for example, which is interesting from the bio-medical side of things with implants materials and so forth, that we can actually use titanium atoms too to cross in these materials and those materials seem to have even stronger, even higher strength than the iron based materials." Holten-Anderson expects the nature-inspired material will have practical medical and industrial uses. A patent is pending on how to make the gel, which is described online in the Proceedings of the National Academy of Sciences.